RTÉ 2FM’s Game On programme was transmitted live from Dubarry Park last Thursday evening, with Robbie Henshaw a special guest. Henshaw was joined by former Ireland and Buccaneers coach, Eddie O’Sullivan, Connacht captain John Muldoon, and former Ireland player Reggie Corrigan on the panel. 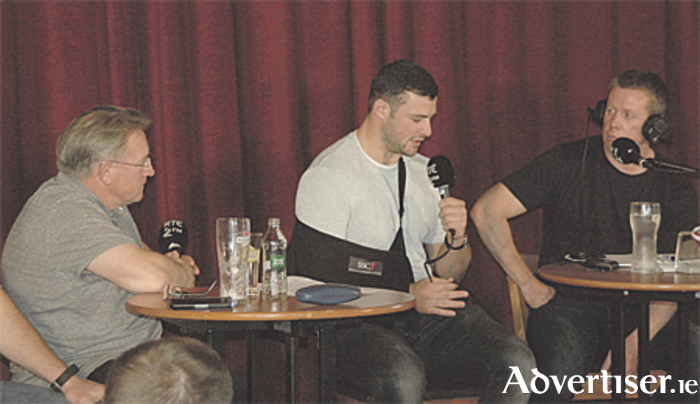 A segment of the show concentrated on Henshaw’s experience of the tour. When queried as to his preferred position, Henshaw replied that number 12 is now his primary position. Questioned by an audience member as to when he originally felt his rugby career would take off, Henshaw said Eric Elwood brought him in to Connacht just after he had sat his Leaving Certificate. “Connacht had a lot of injuries at that time, and I debuted off the bench in a friendly against Exeter, then started against Harlequins the following week, when I scored a try,” Henshaw said. When he was swiftly called up to the Ireland squad, Henshaw said he found that a huge step up. He said harsh lessons were learned, especially against Australia, but that he took all coaching on board in an effort to improve. Muldoon interjected to say that he first saw Henshaw in action as a schoolboy at The Sportsground. He said the young Athlonian’s Debs was on the eve of the Harlequins match, yet despite this, and the fact that he was with Connacht less than a month, Henshaw was the best player on the pitch. Muldoon said he knew then that Henshaw was special and that it was only a matter of time before he would play for Ireland. Regarding the pectoral muscle injury that ended his Lions adventure prematurely, Henshaw said it occurred in a pretty innocuous manner when he over-extended in a wrap tackle. He added that he had surgery last week and the prognosis is that he will be out of action for 12 to 16 weeks. He said his focus is now on getting fit for the long season ahead.